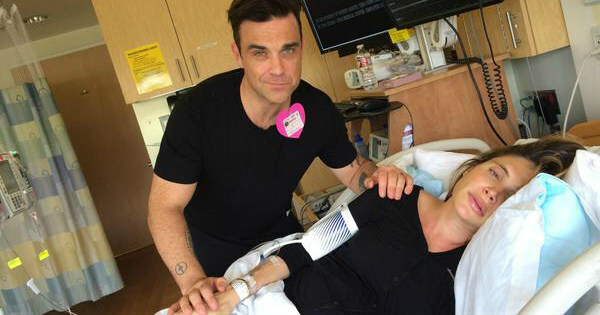 Singer Robbie Williams and wife Ayda Field have welcomed their second child – and the superstar live-blogged the whole thing from their delivery suite. In a good-humoured series of tweets, videos and photos, the 40-year-old pop star documented the 24-hour labour overnight. It started with this cheeky tweet of Ayda’s sky-high Christian Louboutin heels. Finally, about 11am AEDT today, they posted their final video announcing the birth of their healthy, 3.68kg as-yet-unnamed baby boy. At times Ayda looked like she wanted to wallop her husband, but the loving couple reassure fans in their last post that “no mummies were upset or harmed in the making of these videos”. He explains the couple started off with the idea of the Louboutins and “it just snowballed from there”. “Of course everything we’ve done has been a bit of a laugh and it’s helped Ayda get through take her mind of the pain. I hope we made you laugh in the process. It’s made the whole experience really magical and whimsical and lovely,” he says. “Thank you for sharing that with us,” says Ayda.